Our classic range of products will need care and repairs. We therefore provide replacement windmill blades and sails. 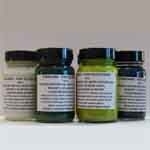 Touch up paints for all our gnomes with external garden paints in various colours.